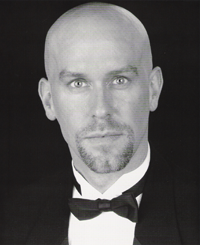 Martin A. Lescault holds a degree in Music Education from the University of Southern Maine, and has done graduate work in vocal performance at the New England Conservatory of Music in Boston.Mr. Lescault has been featured as a soloist with such groups as the Portland Symphony Orchestra, the Boston Pops, the Orlando Symphony, the Maine Music Society, the Choral Art Society, and the Midcoast Symphony Orchestra. He has performed with ensembles throughout the New England area such as Portland Opera Repertory Theater, the Portland Early Music Consort, the Schola of St. Mary’s Cathedral, and Referendum, a 5 voice a capella ensemble. Awards include first place honors in the Maine NATS competition, and the Rossini Club Scholarship competition. In early 2013, Martin was a featured soloist in Colby College’s “Light of the Mind” Bicentennial celebration. He is a proud member of the Cathedral Choir of St. Luke’s Episcopal Cathedral in Portland, ME, where he currently resides. When not performing, Martin works in the Finance Department of WEX Inc., a payment solutions company in South Portland.